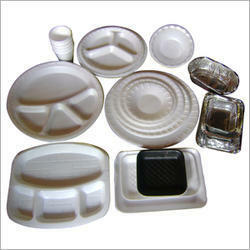 We are a leading Exporter of disposable crockery from Mumbai, India. Focusing on the quality of Disposable Crockery, we have gained a respectable position across the national and international market as a supplier. Commonly used for buffets, birthday parties and other events, these items are manufactured using high-grade materials at vendors' base. The crockery offered by us are available in different sizes, owing to which these are widely acknowledged in the market. Also, our offered Disposable Crockery won't absorb oil or leak.